Fantastic perfume, borne by flowers of true beauty. They are generous in size, pure in colour and elegant in form. 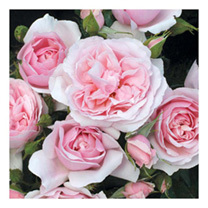 Also resistance to disease is excellent, making this an easy rose to grow and to look after. Scent 8. Colour - light pink. Height 120cm. Bush variety. Supplied in a 4 litre pot.